Cloud-Based Solution Syncs GAL and Public Folder Contacts to Microsoft Office 365 Users. June 14, 2016 – Campbell, CA – CiraSync, the cloud-based solution that makes everyone reachable by syncing the GAL to Microsoft Office 365 users and their smartphones in about a minute, is now available through the Microsoft Azure Marketplace. CiraSync, a SaaS-based solution, also syncs Public Folder and CRM contacts to Microsoft Outlook and smartphones. The availability of CiraSync on Microsoft’s increasingly popular cloud platform means that any organization using Office 365 can immediately update all Public Folder and GAL contacts to all its mobile users. CiraSync is tightly integrated with Office 365 Exchange and Azure Active Directory, and hosted entirely in Azure. said Vern Weitzman, CTO of Cira Apps Limited. IT consultant Joe Jerebic of Kismet Solutions, a business solutions provider in Calgary, Canada, frequently supports clients that are ready to migrate to Office 365. Jerebic explained that without CiraSync, his client would not have migrated to Office 365. Kismet Solutions investigated other options for its client, but chose CiraSync for its ease of use and low maintenance. Enterprise single sign-on – Azure Active Directory supports rich enterprise-class single sign-on with CiraSync out of the box. Users sign into CiraSync using their organizational accounts hosted in Active Directory. A full, managed tenant solution, the Enterprise Edition of CiraSync allows Office 365 global administrators to configure contact sync for any number of cloud mailboxes. No installation of software on servers, desktops, or smartphones is required by CiraSync. 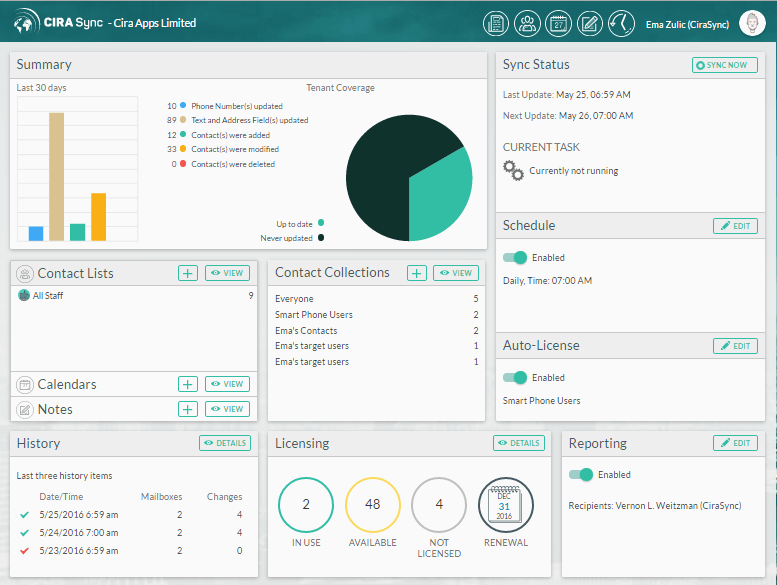 Cira Apps Limited provides the SaaS-based CiraSync contact management solution for businesses that run on Office 365. The free Personal Edition syncs all selected contacts to a single user, while Cirasync Enterprise Edition allows centralized administration of contacts for thousands of mailboxes. CiraSync updates GAL, Public Folder, and CRM contacts to all designated mobile users. For more information, visit www.cirasync.com.